RJL Software - Support - FAQ - AutoRun Wizard - Why am I seeing the Windows 7/Vista AutoPlay Dialog Box? Why am I seeing the Windows 7/Vista AutoPlay Dialog Box? 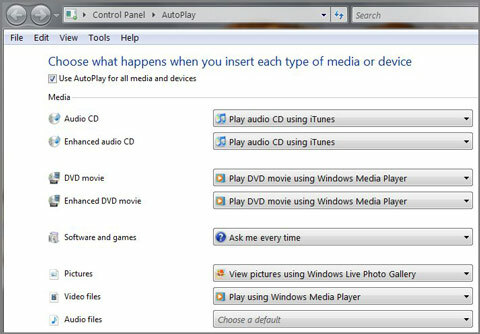 When inserting a CD or DVD, or connecting an external hard disk drive or flash memory drive, Windows will recognize the device and then, depending on the type of files on the device, display the AutoPlay dialog box. The options displayed in the Dialog Box can vary depending upon what application software is installed on the computer. 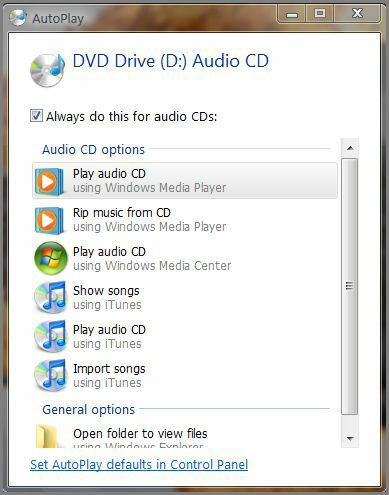 The example below shows a system inserting a audio cd. This dialog box will tell windows how to handle the specific device and media type this time or every time if the "Always do this for..." box is checked at the top of the Dialog Box. If you decide that you would like to change any of these settings at a later time they can be easily modified by using the AutoPlay Settings Panel shown below. To get there open the Start Menu - enter the text autoplay in the Start Search box - press Enter. If you are only creating data CD's which present the user with a menu or pdf or non-audio data, then for "Software and Games" choose autoplay. This type of media and device control is a significant enhancement from Windows XP. It is easier to access, has a simpler interface and is much more functional. Now users are able to control the AutoPlay settings. Download more software like AutoRun Wizard. Search the FAQ for your answer.